WARSAW - The United States and Poland signed an agreement here yesterday to place parts of a US missile defense system on Polish territory, finalizing a long- negotiated deal in the face of Russian warnings that Poland would become a potential target for attack. 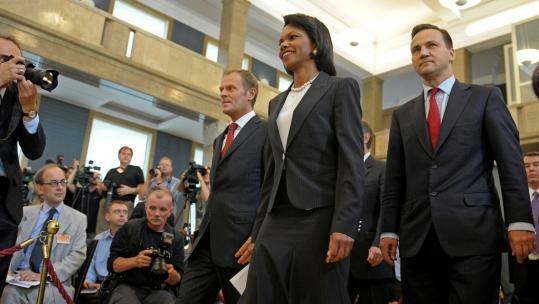 At a signing ceremony with the Polish political leadership, Secretary of State Condoleezza Rice said the system, which will place 10 missile interceptors and more than 100 US troops here, will "help us to respond to the threats of the 21st century." The agreement, suddenly concluded after 18 months of negotiations, came at a time of heightened tensions between Russia and the NATO alliance over the war in Georgia. NATO said Tuesday that it will suspend "business as usual" with Russia after its invasion of its southern neighbor. Despite pledges from Moscow that it would withdraw its troops, Rice said there was little sign yesterday that the Russians are ending what NATO has called their "occupation" of Georgia. German and French officials voiced similar charges yesterday. The Polish-based interceptor rockets, along with a radar installation to be based in the Czech Republic, will provide a European base for a defense system the Bush administration has insisted is not aimed at Russia but at "rogue states" such as Iran. In comments to reporters, Rice said that she and other officials had "personally talked with the Russians many times" about measures the United States could take to demonstrate that the system is intended to counter "small missile threats of the kind that Iran or North Korea might impose, and not aimed in any way at Russia." Russia contends that the system would allow the United States to peer deep into its airspace. A senior Russian general, Anatoly Nogovitsyn, said last week that it was "100 percent certain" Poland was "making itself a target" by entering into the agreement. The interceptors reportedly will be based in northern Poland about 800 miles from Moscow. The text that the two sides signed said the United States will provide "substantial assistance to support Poland's military modernization efforts," including a battery of four Patriot missiles and a US troop contingent. The Warsaw government made clear that it wants the Patriots as a defense against possible aggression from Moscow. The deal follows an earlier agreement to place the second component of the missile defense shield - a radar tracking system - in the Czech Republic, another formerly communist country now in NATO. "We have achieved our main goals, which means that our country and the United States will be more secure," Polish Prime Minister Donald Tusk told Rice after the signing.